YUYAO HUAYIDA ARTS & CRAFTS CO., LTD.
South East Street Yuyao City, Zhejiang. YUYAO HUAYIDA ARTS&CRAFTS CO.,LTD. Is located in the place which has name of plastic kingdom-Yuyao city Zhejiang province, the north is close to Shanghai, connects with Hangzhou in the west, there are harbours of Ningbo that reach the sea, The transportation is convenient, the environment is exquisite! 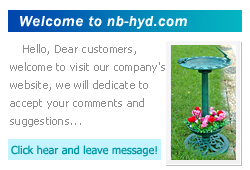 Our company produce RESIN BIRD BATH series of products, products sell well in the U.S.A,Europe, England and such more than 10 countries. Aim on company abide by "the quality first, the highest prestige have", welcome domestic and international customer come cooperation wholeheartedly, create beautiful future hand in hand.